Let us paint your garage doors and floors and make sure their done correctly the first time. LET’S HEAR FROM OUR CUSTOMERS! You did a great job! I will be recommending you to all of my friends. My neighbours were so impressed that they ended up getting The City Painters to paint their garage and home exterior as well. WHY CHOOSE THE CITY PAINTERS? CONTACT US FOR A FREE GARAGE DOOR PAINTING QUOTE TODAY! 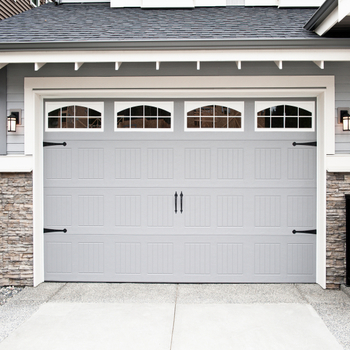 Painting your garage doors is a quick way to freshen up your exterior. Here’s a quick how-to for painting garage doors. Sand– Lightly sand the areas that you will be painting. This will help to remove any peeling paint, and anything that has gotten stuck to the surface over time. If your garage doors are metal, look for rust and sand this off as well. Clean – It is very important that the surface you are working on is clean prior to painting it. A good pressure wash will take away anything left over from the sanding as well as clear away any mold or mildew. Paint– If you garage door is not metal, we suggest using a good quality, latex-based paint. Make sure to read the label and check that the conditions you are applying the paint in are correct and that it’s not, too cold, hot or humid as this will affect the way the paint is applied and also it’s staying power. If you are painting metal doors, choose a product that is specifically made for metal.